The Next Jupiter Season is Not Far Away! There are some important changes. If you are a Radio Jove observer who had submitted data to the archive in the past you will need a new password. Please contact Leonard Garcia for more information. As always viewing and downloading data are available to everyone. Enjoy. For some years, the astronomy club / department at Anne Arundel Community College (AACC) has desired to expand its public observing / educational offering to include radio astronomy. In 2010, we began a search for a simple, affordable, reliable and useful, (both scientifically as well as educationally) radio telescope. We selected the Radio Jove kit, and were awarded its purchase price by the AACC Student Association. The installation authorization, however, required a mast design that eliminated any tripping hazards, since the radio telescope would be integrated into the existing student astronomy laboratory on campus. After reviewing the construction manual, we opted for a 15. fixed height dual dipole antenna configuration utilizing a phasing cable for antenna beam steering. In order to achieve a guy-wire free configuration, we opted to install a 6.x6. treated post 30. in heavily packed earth. The top 8. were turned on a lathe to slip-fit inside the 10. x 4. 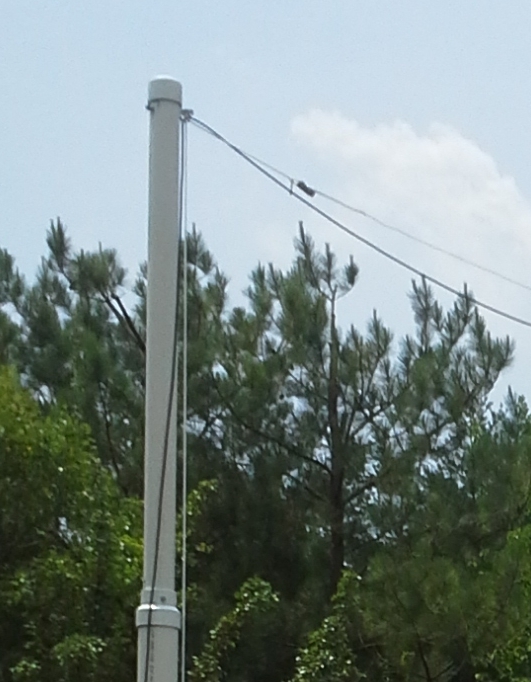 PVC lower mast assembly. Lag screws join the lower mast to the wood post. The upper mast, 10. x 3. PVC, telescopes inside the lower mast through a modified PVC bell reducer. Height is fixed with a bolt through both the 4. and 3. masts. The 3. PVC upper mast is held steady at two points: 1) the upper point at which it protrudes through the bell reducer and 2) inside through the use of a custom machined bushing that firmly locates the lower end of the 3. PVC. This methodology allows us to raise and lower the mast using one bolt to fix the height, drilled through just below the bell reducer. Closeup of upper antenna mast section showing the modified PVC coupling between the 4" and 3" sections to allow telescoping of the 3" inside the 4" PVC. The cap and eye bolt assembly is visible at the top. The rope that holds the antennas runs through the upper eye bolt to allow raising and lowering without a ladder. The primary feedline also run through the eye bolt to allow the observatory's rolloff roof room to move as the JOVE antenna sits directly over the tracks for the roof. The primary feed-line from the Southern dipole set runs through conduit underground to the Northern dipole set and junction box where the use of a phasing cable allows beam steering. After the signal combiner, the coax runs through a grounding block, then again runs underground through conduit into our radio room in the observatory. The antenna looks like two parallel capital T.s. 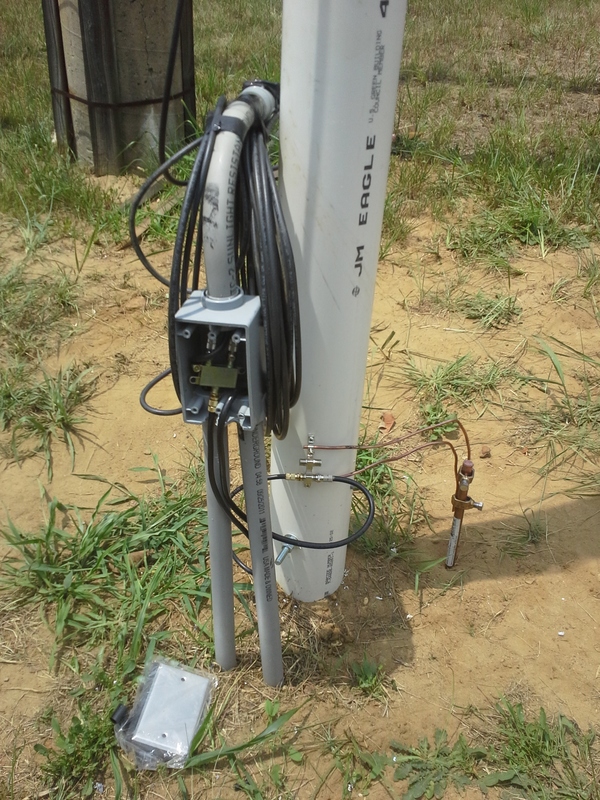 Lower section of north east antenna mast shown with junction box, power combiner, grounding block and ground rod. Our antenna masts have remained standing with no discernible detriment through three serious storms including Hurricane Sandy. We installed eye bolts at the top of the masts and use them like pulleys with ropes to raise and lower the antennas if necessary. Ropes are anchored at the base of the masts. As Jupiter gets closer and closer to going behind the Sun relative to our viewpoint from Earth (conjunction) it becomes difficult to pick up any radio storms from Jupiter since the Sun is a much stronger radio source. The Sun also enhances the charged particle layer above our atmosphere (the ionosphere) and the increased density of this layer makes it more difficult for the Jupiter radio signals to penetrate the ionosphere and reach our antennas on the surface of the Earth. This year the conjunction of Jupiter with the Sun occurred on June 19th. After this date Jupiter will start to move away from the Sun and rise before the Sun in the morning sky, increasing the distance between the two of them each day. So, a couple months after conjunction (mid-August) Jupiter may be far enough away from the Sun that we can start to listen for Jovian radio storms in the early morning. Thus, it is not long until the new Jupiter observing season begins. The conditions for hearing Jupiter radio activity will continue to improve as Jupiter appears farther and farther away from the Sun. It will reach opposition (the point where it is on the direct opposite side of the Earth from the Sun) on Jan. 5th, 2014. Then Jupiter will best be observed in the late evening sky and gradually appear closer to the Sun. The conjunction in 2014 will occur on July 24, 2014, so, if we assume that the observing season ends about two months before that, we have from August, 2013 to May, 2014 for our Jupiter watch. Another interesting aspect of Jupiter radio emissions is that, on average, we receive stronger radio emissions when Jupiter is high in the sky from the observer's viewpoint (declination of the Earth as measured from Jupiter). Jupiter has been high in the sky for several years and will still be quite high in the coming year. The conditions are right for great observing! We hope you will join us for the exciting Jupiter season soon to come. Imagine a personal lightning detector that tells you in real-time how close lightning is to you, right now, via the location based service on your smartphone. The newly redesigned version of the WeatherBug app has a unique feature: it can tell users exactly how far away the nearest lightning is. This feature, called Spark, uses readings from the world's largest and most advanced array of lightning detectors. 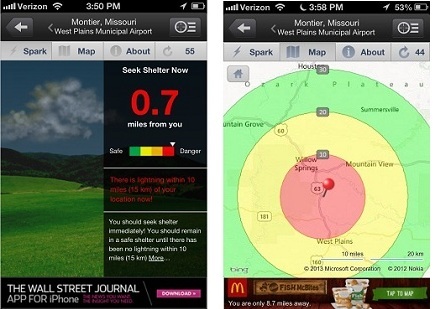 It provides users with minute-by-minute and mile-by-mile lightning information, with recommendations for when to seek shelter. Naturally, this app also provides general weather information, such as forecasts and current weather conditions. This is based on 10,000 neighborhood-level, professional-grade sensors - the densest weather network in the U.S. WeatherBug also delivers data from the National Weather Service, the World Meteorological Society, and numerous other sources. In the June 2013 QST magazine (a ham radio publication) there is an interesting article by Robert Wilson titled "The Great RFI Hunt". RFI means radio frequency interference. Wilson goes to great lengths to track down interference to his ham radio receiver. While he writes about interference in the amateur radio bands his findings may be helpful to Jove observers listening on 20.1 MHz and also those operating spectrographs. A replacement computer power supply (Silencer 760 watt) from PC Power (www.pcpower.com) produced far less RFI than the original supply in his computer. 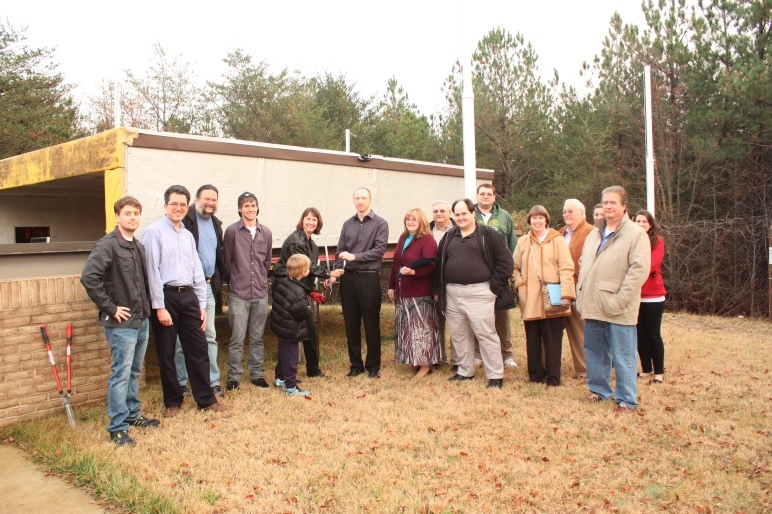 We recently placed a new dual-dipole antenna at our remote observatory site located in Mountain Rest, South Carolina. The antenna is located about two hundred feet from the Radio Jove receiver and spectrograph. The coaxial cable travels through a one and one quarter inch underground conduit. In our particular situation the conduit was buried with plans to pull the cable through at a later time. The cable pull was accomplished using a shop-vac technique. A small piece of bubble-wrap and tape was fashioned into the shape of a "piston" of a size just smaller than the internal diameter of the conduit. A strong, supple string was attached to the bubble-wrap "piston". Then a standard shop-vac was attached to the opposite end of the conduit. With essentially no effort at all the very light-weight "piston" was pulled through the conduit in only seconds. The coaxial cable was attached to the string and pulled through without problem. It is uncertain what the limiting conduit length would be. Judging by the ease with which this technique worked for us, at least another two hundred feet could be negotiated. Figure 7.5 in the first edition of Listening to Jupiter and Figure 9.5 in the second edition, shows a hybrid ring used as a power divider. Thanks to Dave Typinski and his sharp eye for pointing out that the diagram is incorrect. As shown, the signals from input ports 1 and 2 will cancel at the output. In order to correct the drawing, simply take the output from the top where the 50 ohm resistor is shown and move that 50 ohm resistor to the bottom where the output is currently shown. Now the ring will act correctly as a power combiner. (Note: this power combiner is not used in the standard Jove antenna set-up).